The Eatonton City Council meeting seemed more like a theater Monday night with more than 175 people attending, often cheering and applauding as council heard and responded to public input on a movie-making company leasing the old prison. The large audience gave a standing ovation when council approved the lease for the Downtown Development Authority to lease the city-owned prison facility to Tytan Pictures, a film division of Tybee Island based content creation company, Tytan Creates. The vote passed 5-2, with the dissenting votes coming from Alma Stokes and Alvin Butts. “Because I know Tytan is not going to live up to their word,” Butts said after the meeting as his reason for voting no. The lease provides Tytan the opportunity to lease the old prison for 10 years at $10 per year; it also provides Tytan the option to purchase the prison, not with money, but by providing specifically-detailed marketing and branding services for the City of Eatonton. Tytan executives were searching in Savannah earlier this year for a large warehouse to start Tytan’s full-feature film division, when Eatonton real estate developer Walt Rocker III told them of warehouses in Eatonton. They expressed interest in the old aluminum plant facility on Oak Street, but the old prison owned by the city was the deal-maker. Seven people spoke during public input at the meeting, saying the facilities are an eyesore, noted the empty prison is costing the city thousands of dollars (City Administrator Gary Sanders said in an earlier report the city pays $9,000 a year for insurance on the building plus another $5,000 to maintain the land it’s on); and said Tytan would provide much-needed jobs, boost the economy and would be a good fit to Eatonton’s history and literary themes. During discussion, Butts gave what-ifs, such as an explosion, and Mayor Walter Rocker Jr. pointed out the lease also requires Tytan to have insurance on the building. At the request of council, Tytan co-owner Jim Stone also answered their questions, beginning by saying he was “humbled by all the support we’ve had here in Eatonton.” He quoted the Georgia Department of Economic Development’s report that in 2015, Georgialensed feature films and television productions added $6 billion to the state’s economy. He noted Georgia offers 30 percent tax credit to film companies. Stone said Tytan already has a documentary lined up that they will start shooting in Eatonton in the “fourth quarter of this year,” and he was in discussion with a game show about doing a series here. Councilor Bill Mangum said the University of Georgia had given the same “deliverables” of marketing and branding services years ago that Tytan was to provide in exchange for the property, according to the lease. Although the question seemed rhetorical, members of the audience immediately responded by shouting “yes” almost in unison, and applauding. Councilor James Gorley said he initially had some reservations, but not after hearing Stone. “The lease says they have 10 years to deliver jobs, well I think we would know in 36 months if they are doing that. I think it’s a good partnership and I think we need to launch it,” he said, bringing more applause. Because renovating the old prison was one of the recently-voter-approved Special Purpose Local Option Sales Tax (SPLOST) projects, Mangum questioned what will be done with the designated $80,000 – Huskins said as long as DDA is the landlord, the money may be used on the prison, otherwise it will go back to the county. After the meeting, Toni Davis, a member of the current Eatonton-Putnam Chamber of Commerce’s Leadership Putnam class and owner of Simply Beautiful boutique, said she was glad the vote passed. 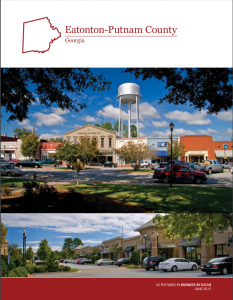 “We, the younger generation, are ready for Eatonton to move in a new direction,” she said.